Earlier this year, we announced a Mozilla Labs exploration of personalization on the Web in which users see content personalized to their interests while retaining control of their data. Since then, we’ve been listening to feedback and ideas from users, web publishers, and content creators, and exploring how this concept could work in practice. We think Firefox is well-positioned to help users save time by finding content on their favorite topics more easily, and help publishers get the right content to the right users to keep them coming back for more. We’d like to share our latest thinking on how this could work, and have posted some initial ideas in the Mozilla Labs group for discussion and feedback. We’re also excited to announce that we recently released the first of several UP Research Studies to a sample of Mozilla’s Test Pilot audience. This first study will give us insight into how well Firefox can match interests on the client using browsing history. Users who opt in to participate in the study will give us valuable insights into which algorithms perform best, without sending any specific website URLs to us. If you’d like to participate in the study, you can install the add-on directly from AMO. If you’re interested in personalization or UP, we’d love for you to subscribe to our group and contribute to the discussions. We have lots to talk about in the coming weeks and months! Please enjoy our latest installment from Mozilla’s lab designed to hatch promising Mozilla products built by Mozillians. In April some Mozillians started working on a collaboration service called TowTruck. This has made some fantastic progress over the last 6 months, and this week the team (comprised of many Hatchery mentors 😉 announced an expanded scope and new name to reflect this, TogetherJS. By embedding just a few lines of code into your site, you can now collaborate on various tasks in real-time, whether development, shopping or other forms of decision making. We encourage you to take a test drive, and to certainly provide the team with feedback. The Mozilla Summit is coming! Members of our team will be at the booths on Saturday at each Summit location. Please come visit us to learn more about what we can do to support your promising Mozilla project! Mozilla TowTruck is now Mozilla TogetherJS. It’s just a different name, with the same underlying experience and technology. 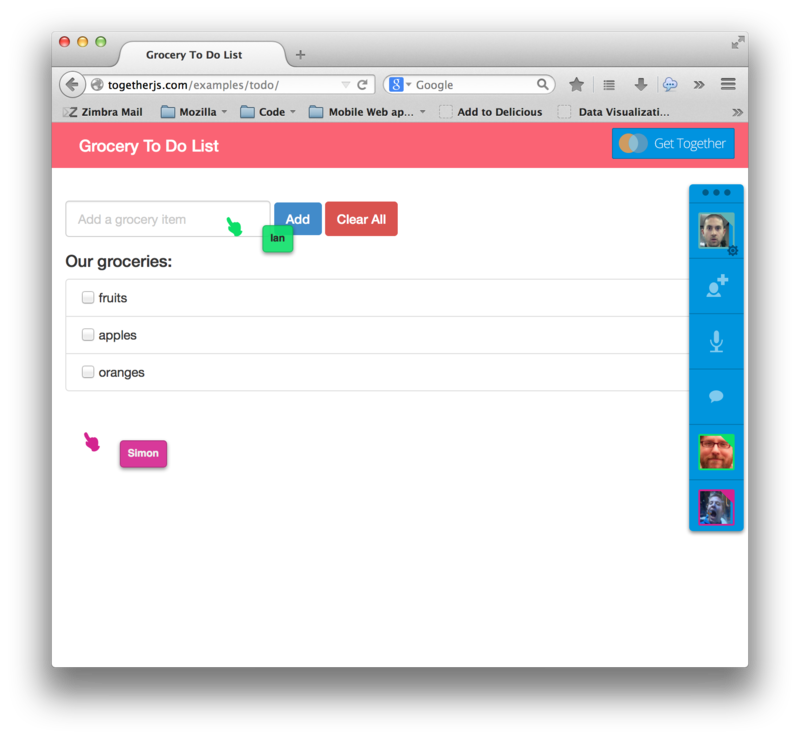 TogetherJS is a service that adds collaboration features and tools to your website. TowTruck initially started as a service for developers to add to their site so their users could ask their friends for help in real-time whenever they got stuck. While this feature and concept is still there in TogetherJS, the product quickly grew beyond this initial concept to support real-time collaboration for any user context, such as co-authoring, co-editing, and co-researching. We wanted a name that reflects the wider scope of how to use the tools. TogetherJS is about connecting people and knowledge to collaborate in real-time on anything, in any situation where two (or more) people are using or doing something together. We also wanted to be sure people understand that TogetherJS is a service you can add and integrate with your site using simple client-side techniques. We’ve rebranded the website as TogetherJS and we’ve added in some sample apps that you can test with your friends using TogetherJS. The documentation also includes a feature where you can connect directly with the TogetherJS team. Also the TogetherJS dock is improved based on usability testing. 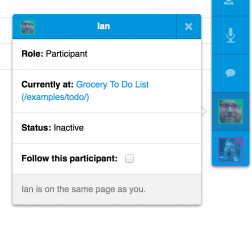 Auto-follow – a user can now automatically follow another user from page to page. 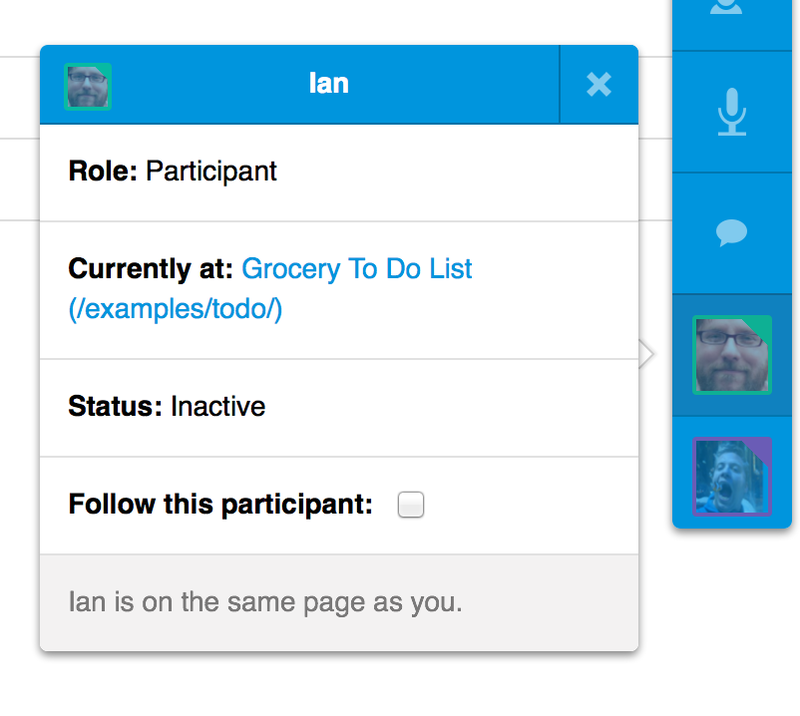 Participant windows – users can now see more detail about who is in the session with them. Profile settings – you can now add your own avatar and select your own user color. Improved notifications – notifications have been updated to make it easier to see what participants are up to and where they are in the session. Mobile – we have a rough usable prototype for mobile (note – this is not the final version). For our next steps we’re looking for guidance and requests from the community! For the next few months we’re focused on new users and contributors, and we want our priorities to reflect the feedback we get from you. To learn more and get started with TogetherJS, please check out our new site here! Please find the latest update from Hatchery and stay tuned as we form our plans for the upcoming Mozilla Summit! At WebFWD We’ve been super fortunate to have Diane Loviglio, a Mozillian and now entrepreneur herself, walk our teams through some very practical ways to get the most out of user research to ensure what feels like a burden of time becomes an infinite time-saver en route to building useful products that people actually need, want and use. To ensure your product development efforts are fruitful, please read on and even better, research on! Actions, not opinions. Your goal in talking to users is to elicit facts and behaviors, not opinions. Because what will matter more for your business is how people behave (e.g. whether they buy your product) more than what they say they think about it. No boilerplates. Alas, as much as we want to have templates and boilerplates to help us, you do yourself a disservice when you want to start from someone else’s survey/screener/interview template. Everything you need to discover is highly dependent on your specific market, business and solution. If that is easily replicable in a boilerplate, you have bigger issues to consider. Prioritize. Along these lines, you need to distill exactly what things you need to discover at the phase you are in. Depending your product, you may care about someone’s age, or gender…or not. Similarly, while your product may apply to lots of segments, you need to focus on one at the start. Diverse feedback is precious. Get lots of input on your tools, even if the reviewer is not in your ‘target market.’ Because You Don’t Know What You Don’t Know. Be creative on reaching your target audience. Some segments are hard to reach. For example, one of our teams wants to reach kids; in this case, Diane encouraged them to see how the adults in their lives play a role in the product and reach them…especially if they have a role in deciding whether the kids use the product! Decisionmakers can be just as important as your target audience. The fun part is, as an entrepreneur herself, Diane is practicing these herself on a regular basis. Be sure to check out her progress (and maybe get some bling in the process!) and Share Some Style. Thanks Diane! TowTruck was started about 8 months ago with a goal to greatly enhance real-time collaboration across desktop & mobile. Here’s the latest update from the team! The TowTruck team has been working on prototyping a mobile experience for TowTruck. We want to enable our users to easily collaborate in real-time across desktop and mobile. Imagine using your mobile device to book tickets or buy something for your friend when they aren’t with you. What would it be like if you could easily find, see and compare flights to Hawaii with your friend in real-time on your mobile devices? We want to make these and similar real-time mobile experiences possible with a high degree of user ease. TowTruck participant list is consolidated on mobile. Given how valuable screen real estate is on mobile, we are hiding and revealing only what is needed in context to users. The full participant list in the desktop dock is not a priority, so we are consolidating the participants into one window. Given that each mobile app’s layout is different, we’ll need to indicate to app developers ways for the mobile application to tell TowTruck where it should be placed. In addition, we will need to make sure that the dock is not obtrusive. The TowTruck dock is collapsed. Given the huge amount of mobile screen sizes and device specific interaction paradigms to accommodate, it’s best to make the UI and interactions generic, while yet at the same time familiar to how mobile should work and feel. 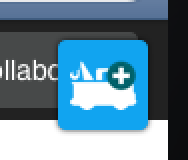 We moved the default dock buttons to run horizontally, so the TowTruck windows get more vertical space in portrait view. The mobile screen also has no hovering mouse cursor. This means the TowTruck “hand” cursor on desktop does not exist. So, we are trying to figure out other ways to show a users’ presence, such as participant notification badges and user tap pulses. If you’d like to follow our progress or even contribute to creating the TowTruck mobile experience, check out our Github Issues here. Also, if you have ideas of how you’d like to use TowTruck on mobile, or apps you’d like to experiment with, also email us at towtruck@mozilla.com! Here’s our newest bi-weekly installment of Happenings at the Hatchery (“What’s Hatching”) and how to get your project (Mozilla or otherwise) to the next level (“Hatch This”). Enjoy! With the introduction of Firefox OS smartphones, we in the Labs’ Hatchery have been thinking a lot about apps for them. Developers like me lust after platforms like this this because we find the technology itself so interesting. I think most users choose a device based on the functionality it provides—functionality that is most often manifested in apps. We need a lot more apps. Building apps should be fun. Building releveant, interesting apps can be fun for non-developers. Games are fun. This seems like an obvious statement, but can we make building apps more like playing games? Can we make learning programming more like gameplay discovery than research? This requires experimentation. It will take more than whiteboards and debate. We’re going to test our hypotheses by building experimental software and introducing it to as many people as possible. 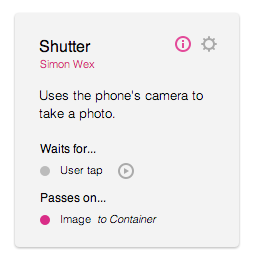 We’re going to test it with users at Campus Party UK. 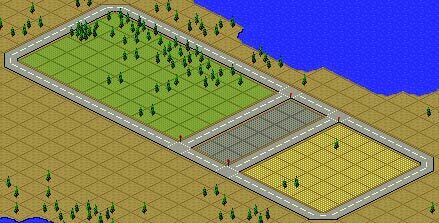 Within SimCity, you learn the mechanics of city planning—zoning neighbourhoods and connecting roads. You do this without worrying about details like permits. Our goal in Appmaker is for the user to discover the mechanics of event-driven programming, without worrying about details like for loops and css layout. 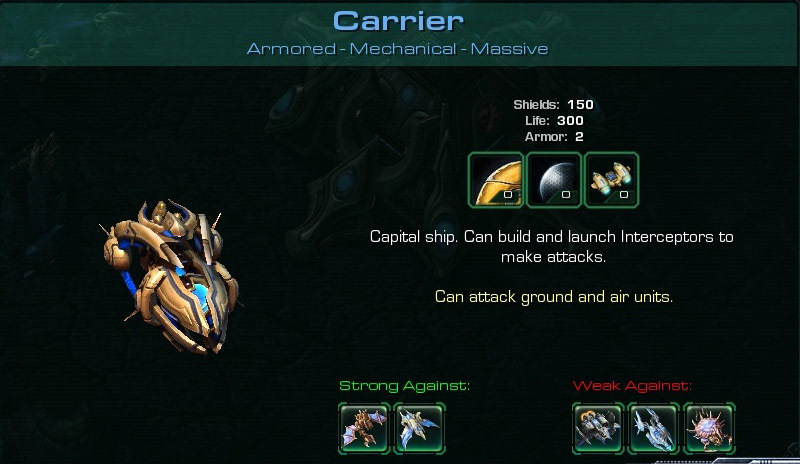 In real-time strategy games, the player produces units. Units perform certain tasks and work well with complimentary units. 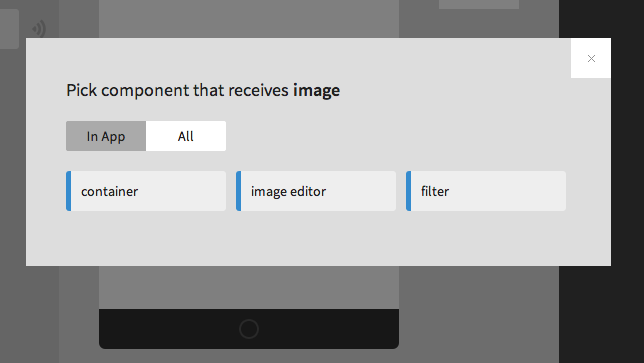 In Appmaker, we’re calling these things components. 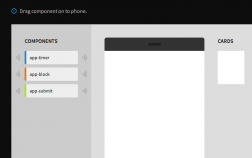 Components linked together provide the functionality of an app and expose the features of the phone. 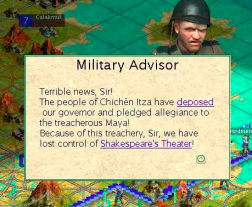 Games have advisors to suggest where you might build or alert that you have trouble. In Appmaker, you will receive tips and alerts to guide you through adding and connecting of components. 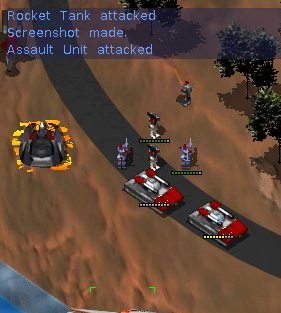 In games such as Command and Conquer, when you use a tank to attack an enemy unit, it moves and starts firing weapons. There is instant and constant action. In Appmaker, components will wait for events. As soon as they happen, the app lights up and data starts to flow. We’ll be complementing the activity indicators with a message log style console. As you progress in a building game, the components you use mature to fit your situation. 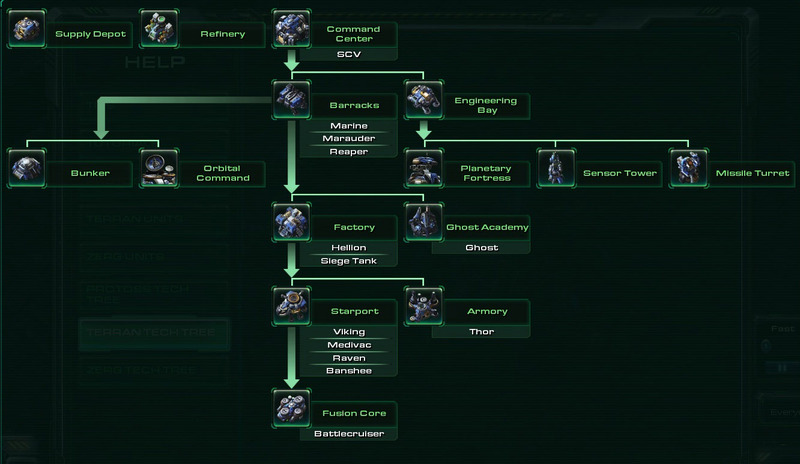 Games contain complex dependency hierarchies that are slowly introduced to the user as they become more advanced. In Appmaker we’re going to present the maker with a limited set of components until they “level up.” We hope the maker will learn at points of interest instead of being bombarded by huge amounts of information. As with any positive hypotheses, we hope they test true. We hope that this is the beginning of something more than seems obvious. Every post we include some practical advice and tools to help you get your product to the next level. This week we’re pleased to feature Mozillian and WebFWD mentor Jane Finette on defining your customer value proposition and key points of differentiation. Because it doesn’t matter how much technical or design beauty your product has if it doesn’t resonate with the rest of the world. Tune in to hear Jane and get some great tools to apply to your project so it matters. One of the many benefits of the Web is its ability to create a unique, tailored experience for the individual user. It’s more engaging to see news from friends and favorite brands when logging into a social network, rather than updates from strangers or random content. When done well, personalization on the Web is a win-win: users find relevant content easier while publishers enjoy increased engagement, fewer bounces, and stronger loyalty. But too often, users unknowingly trade their personal information for this better experience. We recently shared our view that personalization must be handled with respect for the individual user. We want to see even more personalization across the Web from large and small sites, but in a transparent way that retains user control. The team at Mozilla Labs is focused on exploring ways to move the Web forward, and has thought a lot about how the browser could play a role in making useful content personalization a reality. Last year, the Mozilla Labs Prospector team conducted a series of experiments in which a user’s browsing history could be matched with interests in categories like technology, sports and cooking. Users opted in to these experiments, which transparently showed the user these perceived interests to help them gain insight into how they spend time online. But what if these interests were also available for the user to share with the websites they visit to get a better, more personalized browsing experience? As part of these experiments, our Labs team has been thinking about ways in which content creators and consumers could benefit from Web-based interests. For example, let’s say Firefox recognizes within the browser client, without any browsing history leaving my computer, that I’m interested in gadgets, comedy films, hockey and cooking. As I browse around the Web, I could choose when to share those interests with specific websites for a personalized experience. Those websites could then prioritize articles on the latest gadgets and make hockey scores more visible. Destinations like the Firefox Marketplace could recommend recipe and movie apps, even if it’s my first time visiting that site. And, as a user, I would have complete control over which of my interests are shared, and with which websites. With the help of user researchers, we’ve begun testing this concept with volunteer participants to learn how they respond to the idea of sharing their interests on their own terms in order to see personalized content, and the results are promising. We’ve also tapped into a network of innovative Web content publishers such as Hubert Burda Media and Hearst Publications, notably Popular Mechanics, while developing these ideas, and have heard some great feedback and suggestions so far, as mentioned in our post on The Mozilla Blog. We think this type of offering could bring transparent, effective personalization to users all across the Web in ways we haven’t even thought of yet. What do you think about the ability to share your interests for a personalized experience? What are some types of websites you’d love to see adopt this technology? We’re very interested in your take on it, so please let us know in the Labs discussion group. Last month we shared some of the progress that’s happened since launching the Hatchery. This post will mark a series of bi-weekly communications we’ll have to share both updates on our efforts and projects (“What’s Hatching”), as well as some best practices we’ve gleaned from places like WebFWD and the industry (“Hatch This”) to give you support even if you aren’t yet in the Hatchery. If you’d like to get added to our email list, hatchery@mozilla.org, please email us at labscoaches@mozilla.com; we’ll ultimately migrate to using this for our communications. In addition to getting lots of interest from the community to help coach Hatchery projects, we promised to provide greater focus on the areas we at the Hatchery are best equipped to support. If you’re wrestling with a product idea and wondering if it makes sense, there’s no substitute for user research. And there’s few people better than Mozillian Diane Loviglio to help walk you through how to do user research in an effective way. In this post and video, Diane first helps us understand what user research is, and provides us with some great tangible actions you can take to start to vet your idea in the real world, with real people. 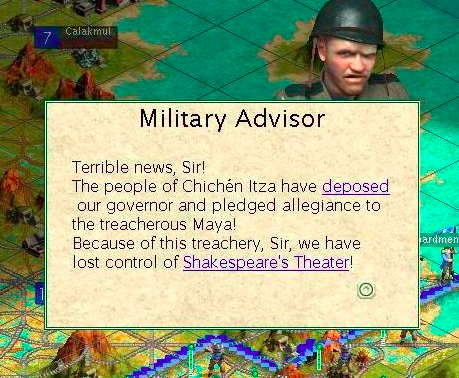 It’s one of our WebFWD teams’ favorites. So please, check this out, go forth and talk to users! Last month we announced The Hatchery, Mozilla’s new program to support emerging product ideas. We want to update you on how things have gone since then, and give you a peek at what is to come and how you can get involved. We have coaches! We heard from many of you wanting to help out as a subject matter expert for product development, design, front end development and more. We had so many offers to help that we’ve created a database of our new coaches, and invite more of you to join with us! One of our first projects, TowTruck, is off and running! TowTruck is a service for websites that makes real-time collaboration easy! It started out a few months ago and we’re providing design and user research support to the team. Though still in its early stages, the press have been super interested in TowTruck; you can read more about TowTruck here and here. Greater definition of focus areas. Be on the lookout for more clarity from us around what kinds of projects we’re prepared to support. Expect themes to emerge, such as “HTML5 mobile apps”, so that multiple small teams can work in parallel, and learn from each other. Prototypes. If you submit an application, must provide a prototype (mockup, sketch, code, etc.) with your application. This will help us better understand your idea and to see if there is a good fit. Refer projects to us. We heard from a few of you and are keen to hear from more. Be sure to check out our program criteria on our FAQ and encourage people in your network to apply. Distribution list. We will set up an email list for interested parties where you can expect updates from us every few weeks. Contact us if you’d like to get on our distribution list at labscoaches@mozilla.com.